Soak leaves, if necessary; then line a baking pan with a layer of leaves. Meanwhile, cook the ricein boiling water for 5 minutes, drain, and mix with meat, onion, parsley, pepper, tomato paste, and half of the butter. TO stuff a leaf, lay it on the counter, vein side up, with its stem pointing towards you. Remove stem with a small sharp knife. You can guage the amount of filling required by the size of leaf-- about a tablespoon for a large leaf, and half that amount for smaller ones. Shape the filling into an oval on the lower stem portion. Fold the bottom of the leaf up over the filling, and sides in owards the middle, overlapping them. Then roll up from the bottom into a tight cylinder. As you stuff the leaves, lay them in a pan, packing htem closely so they don't unravel. 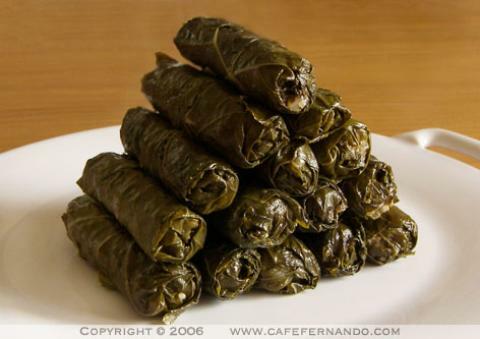 Continue preparing leaves in this manner until all the stuffing is used. Insert slivers of garlic between the rolls, and sprinkle with the rest of the melted butter and the lemon juice. Pour in about 1 cup fo water-- enough almost to cover the leaves. Seal the pan with a lid or foil. Cook on a medium heat for about an hour and a half, until the meat is cooked and well-browned. Check periodically. If the water evaporates, it may be necessary to add more during the cooking. Serves leaves on a large platter, accompaniedby yogurt sauce or plain yogurt.